Spice things up with the zesty flavors of ground beef, peppers, red onion and Mexican rice tucked into corn tortillas! This recipe is a fiesta of flavor, and one that will please everyone at your table. 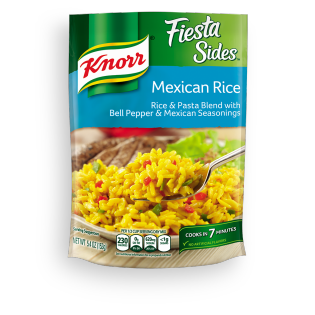 Mexican Rice is rated 4.4 out of 5 by 50. Rated 5 out of 5 by Judy from Mexican Rice---Wonderful! I took this to a pitch-in party a couple of months ago and everyone requested that I bring it again. Unfortunately, I went to the store tonight and they didn't have any of this Mexican variety. Apparrently, it is pretty popular or they never stocked it to begin with. Hopefully one of the other stores in my area will have some. I have already requested it at my regular store. I bought 4 packages and they are gone. Any ideas?? Tastes great and good for adding leftover meat to---hamburger, chicken, or pork---disguise the leftovers and they won't recognize them as such. I'm sure it would work with turkey also. Rated 5 out of 5 by SarahEndlein from Very tasty! Very good. I added sautéed onion, tomato and corn along with a sirloin steak on top. I topped the meal with tomato and raw onion to add freshness. Rated 5 out of 5 by Debbiedo from Great by itself or to add extras to! I've had this by itself and I've added black beans, diced tomatoes, and chicken to it. Delicious! Really like the blend of rice and pasta. Nice alternative to rice or pasta. Rated 5 out of 5 by christyinplano from Tasted great! My husband and I make this as a side anytime we have fajitas, burritos, or tacos. Tastes great and is super easy! Thanks for the quality!